Introduction: A complete overview of Inbound Marketing for business. Inbound Marketing basically focuses on bringing the customers and traffic together. 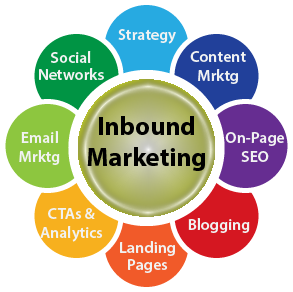 So, Inbound Marketing basically concentrates on getting the customers to know about the company, its services etc. Internet marketing cost less as there is no door to door marketing so lesser expense. Inbound Marketing is the less hectic way of doing marketing as the strategies involved with Inbound Marketing focus on clients coming to the Company rather than the company going to clients. Well we, just saw the benefits related to Inbound Marketing and how Inbound Marketing is a perfect medium for startups, small businesses, and business at their initial stages. The big question how to make the most out of Inbound Marketing? What are the different methods involved with Inbound Marketing? So here we present a small but effective, how to do the guide for Inbound Marketing. Then we will head over to some marvelous stats and logistics related to Inbound Marketing, which will surely make you think to have a go on Inbound Marketing. Well to start with let’s have a look at the components associated with Inbound Marketing. Practicing Inbound Marketing involves various methods including blogs, emails, promotion through social media etc. The following image gives you brief information about various aspects of Inbound Marketing. It refers to creating informative content which is good enough to attract the customers. Your customer needs information which best suits their problem and is accurate enough to think them of hiring you, as you know the first impression is the last impression. For this section of Inbound Marketing, if you are creative and having time to write it on your own then nothing is better than that but if not then don’t worry there are professional content writers waiting to help you in exchange for a few bucks. When we talk about platform for the content, it may be a website, a social media page etc. But if you want to look professional opt for a website. You can hire a digital marketing agency that would take care of all your content need from start to finish. The next phase of Inbound Marketing is Emails and leads which means sending valid and informative emails to your target at regular interval. Remember not to overdo it as you surely don’t want the customers to get frustrated and the emails ending up in trash or spam folder. This is a highly important phase of Inbound Marketing process and requires high amount of professionalism. Next in lines as regards Inbound Marketing is Social media promotion which involves creating pages and doing publicity. TO be noted this could be a highly effective part of your Inbound Marketing campaign as social media use in going sky high and there is nothing as close to your clients as their social media profile is. Hence Inbound Marketing target this point of your clients. After going through the major parts involved with your Inbound Marketing campaign now the next thing you need to do is to conduct research works and analyze your progress, what have you achieved with these strategies of Inbound Marketing and what are the Inbound Marketing strategies you need to alter etc. Suppose for example this is the graph for your business growth then why at period 4-5 it is declining what are the reasons how you can overcome those. So, these were the methods related to your Inbound Marketing guide. But there is one other thing which is a major contributor for your Inbound Marketing. That is SEO which stands for Search engine Optimization who main function is to promote your company’ results in various search engines like google and yahoo etc. Following are some of the statistics associated with the growth of Inbound Marketing tools and its results. To conclude with, it would be right in saying that Inbound Marketing is surely a better way for promoting small business and effective too in terms of investment, manpower and infrastructure. All in all it’s a good idea to make use of Inbound Marketing along with other strategies and tools to achieve a substantial margin of revenue along with market share.